Enjoy travelling for free with Swiss Travel Pass on (almost) all Swiss rail routes, postal bus or bus and shipping lines. Hardly any other country than Switzerland has such a well-built and partly highly comfortable public traffic system, which does not only serve for locomotion but really combines travelling by Panoramic trains with pleasant locomotion. The Swiss Pass offers a simple and favourable possibility of acquiring a ticket for (almost) the whole of Switzerland. With Swiss Travel Pass you can choose to unrestrictedly travel on 3, 4, 8, 15 days by all means of transportation of Swiss Travel Systems without having to buy another ticket. Apart from long-distance traffic, Swiss Travel Pass owners can also use local traffic buses in 90 towns. 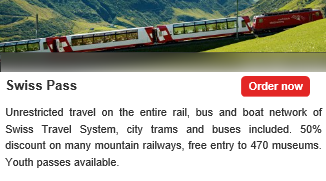 In addition, Swiss Pass owners receive a 50 % discount for travelling by most of the mountain railways and for visiting approx. 500 Swiss museums for free. Children under 6 years old travel free. Children aged 6 – <16 years travel for free if accompanied by at least one parent – Without a parent, a 50% reduction of the adult fare.